The Writer’s Guide to E-Publishing is your destination site for practical and real information about E-Publishing romance, mystery, and any other genre you can think of. We share what we’ve learned – including the good, the bad, and the ugly – as well as our ”real numbers” stats. Our goal is to do a lot of the legwork for you, to keep you informed, and empower you as you embark or continue on your own publishing journey. We keep it positive, and we keep it real. 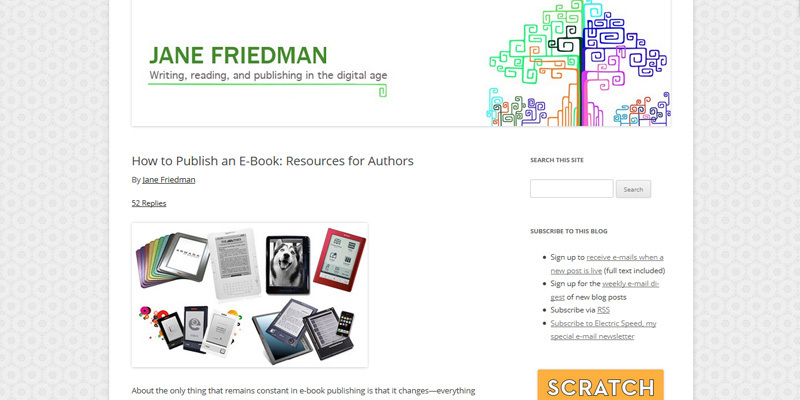 We are writers, navigating our way through the rapidly evolving world of e-publishing. Nothin’ beats writers helping writers reach readers! Joseph Andrew Konrath was born in Skokie, IL in 1970. He graduated from Columbia College in Chicago in 1992. His first novel, Whiskey Sour (2004), introduced Lt. Jacqueline “Jack” Daniels. Others in the series include Bloody Mary (2005), Rusty Nail (2006), Dirty Martini (2007), Fuzzy Navel (2008), Cherry Bomb (2009), Shaken (2010), and Stirred (2011). The books combine hair-raising scares and suspense with laugh out loud comedy. Joe is also the editor of the hitman anthology These Guns For Hire (2006). His short stories have appeared in more than sixty magazines and collections, and his work has been translated into ten languages. Under the name Jack Kilborn, Joe wrote the horror novels Afraid (2009), Trapped (2010), Endurance (2010), and Draculas (2010). 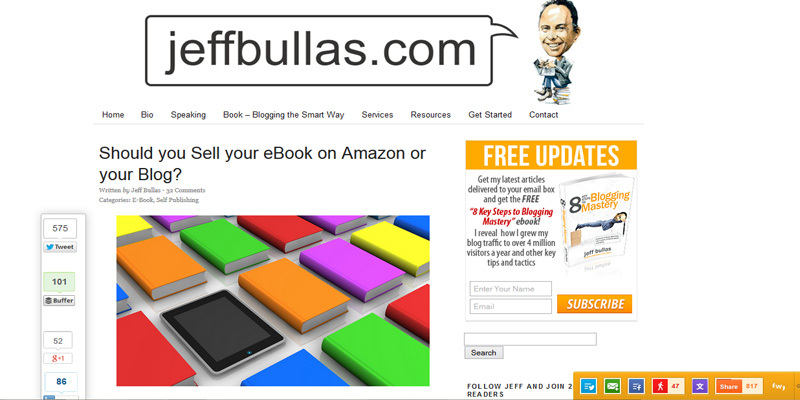 He has sold over 500,000 ebooks. 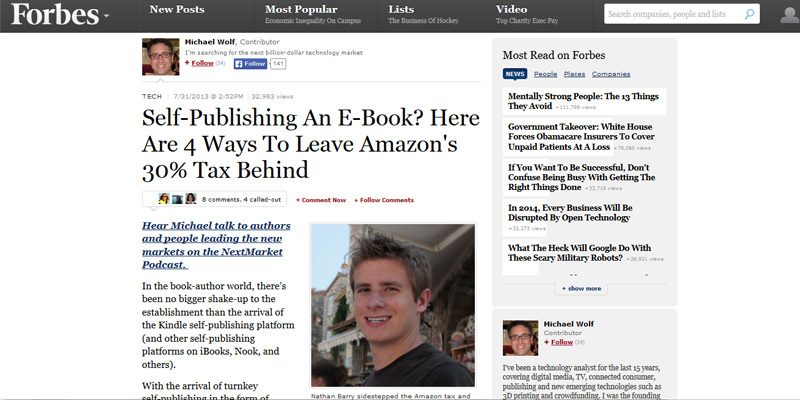 Booktango is the latest e-book publishing innovation from Author Solutions — the world leader in indie book publishing. 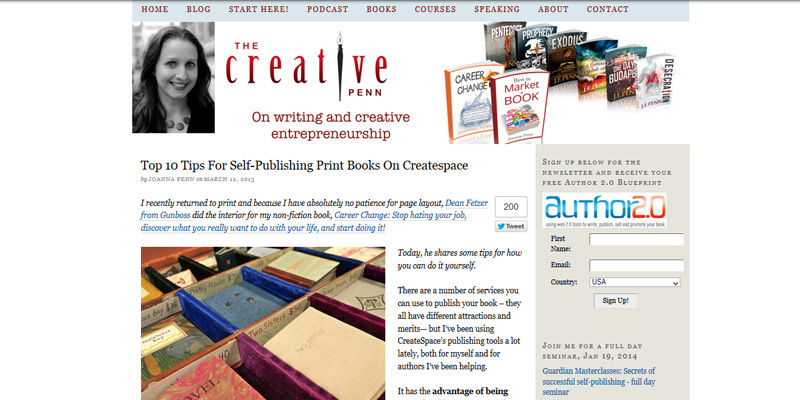 We’ve already helped more than 140,000 authors self-publish, promote, and bring to market more than 170,000 new titles. Gone are the days when you have to struggle through confusing e-book publishing tools that force you to either give up all control or figure everything out by yourself. With Booktango, we give you access to DIY ingenuity, the right mix of time-saving professional services, and a network of the most popular online retailers, so you can finally publish an e-book that rocks. Whether you need us to take the reins and knock out a flawlessly formatted e-book for you, or you want us to step back and let you do-it-yourself using our precise e-book editor, Booktango’s got your back. You know what you want. And together, we can make it happen. Over the past decade, CD Baby, the world’s largest digital distributor of independent music, helped level the playing field between DIY musicians and major labels by opening worldwide distribution channels to unsigned artists. 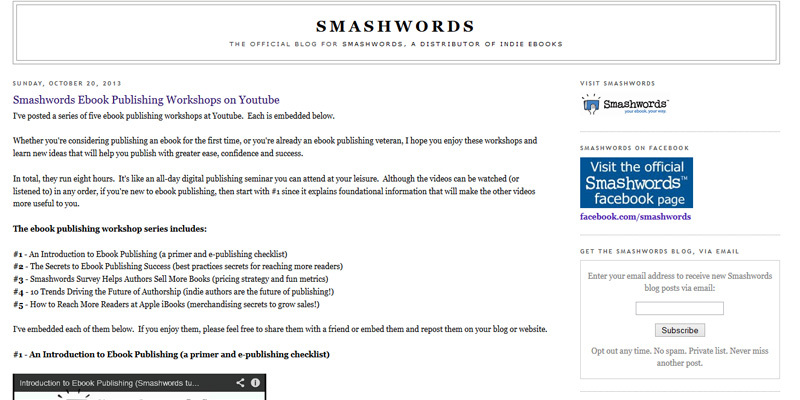 Now, with our recently launched BookBaby division, we’re doing it again for the publishing industry. Whether you’re an author, poet, memoirist, or small press, BookBaby can digitally distribute your independent eBook content to all the major retailers so that it is available for all the most popular eReader devices. 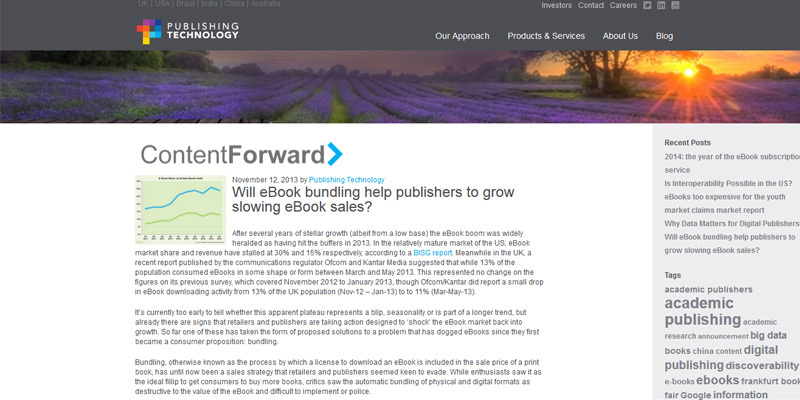 Publishing Technology plc is the world-leading provider of content solutions that transform business. We cover the publishing process from end to end with content systems, audience development and content delivery software and services. Combining our unmatched publishing knowledge, global operations and perpetual support model with our advance operations system, ingentaconnect scholarly portal, pub2web custom hosting platform and Publishers Communication Group (PCG) sales and marketing consultancy, we offer the industry’s only full spectrum of solutions to help publishers move their content forward. 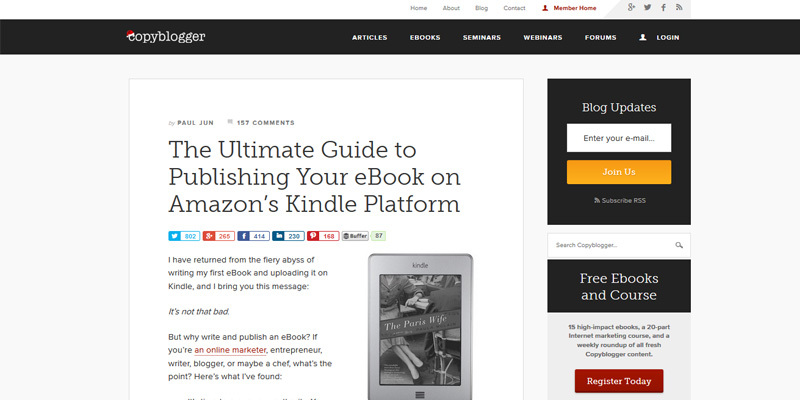 Writing an e-book is a huge achievement — and one that you deserve to be proud of — but it’s only the first step. 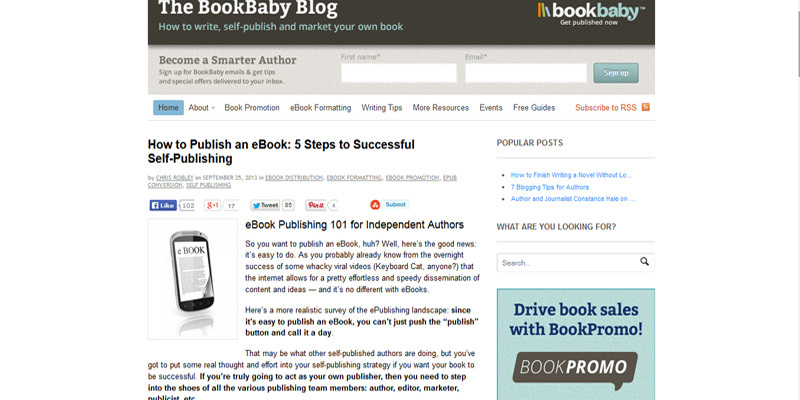 You also need to publish your e-book, to convert it from a manuscript on your computer to an attractively laid-out e-book file that’s easy and enjoyable to read. And after you publish your e-book, you need to market it — after all, if no one knows that your e-book exists, no one can buy it. 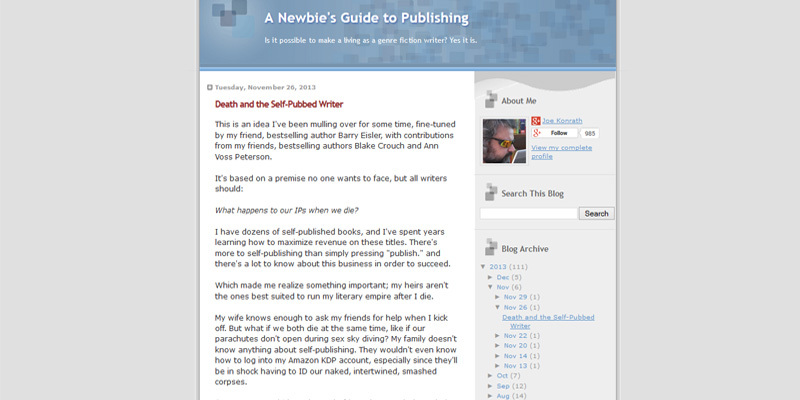 I self-published my first non-fiction book in 2008 and made a lot of mistakes along the way. I also didn’t sell any books because no one knew who I was. That experience made me determined to learn about marketing, as well as how to become a better writer. I started this site to share my experiences and hopefully save other people the money, time and heartache I went through. As I become more confident in my writing, I decided to revisit my dream of writing fiction. 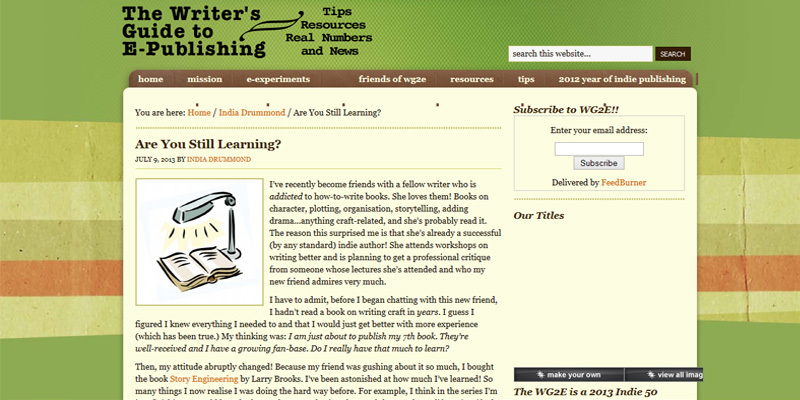 I joined National Novel Writing Month (NaNoWriMo) in 2009. 20,000 words later, I had a nugget of an idea that blossomed into my first novel. During the journey of writing my first ebook, there were many roadblocks and sudden realizations that I faced; it’s only right for me to share them with you so that you can avoid undermining your ebook’s true potential, or at least starting from scratch. 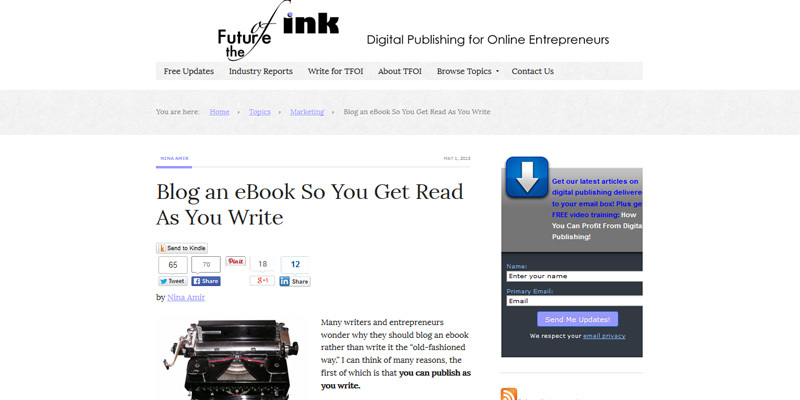 You will find the crucial issues that you must overcome when it comes to writing the ebook and marketing it. Answering these questions mindfully will help you stay on track, deliver a compelling ebook, and prepared you as best as possible. 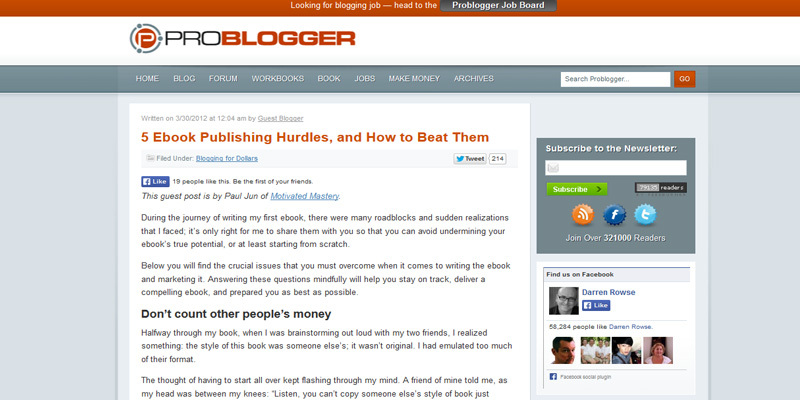 Copyblogger started as a simple one-man blog. Today, Copyblogger Media is a software and training organization with more than 115,000 unique customers — and it was all done with useful content, smart copywriting, and solid products and services. 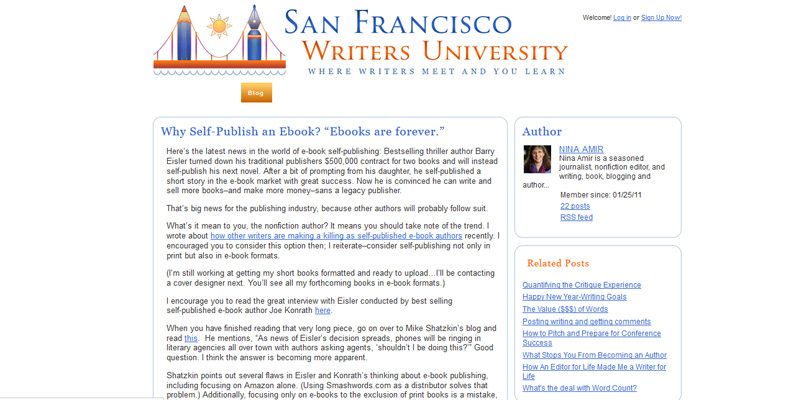 San Francisco Writers University is a project of the non-profit San Francisco Writers Conference, a 509a2 tax exempt charity, which supports a wide variety of writing and literacy organizations throughout the United States and hosts the world-renowned three-day San Francisco Writers Conference every President’s Day weekend in mid-February. The courses and events at San Francisco Writers University are focused on solving problems and sharing knowledge. They are not accredited courses and this is no substitute for a Master of Fine Arts degree at a college or university. 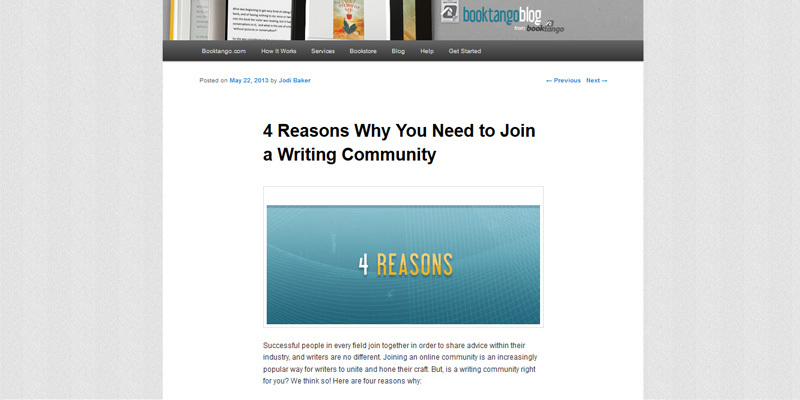 Our goal was to give tremendous value to our “students”, as well as an online place for them to gather with other writers. 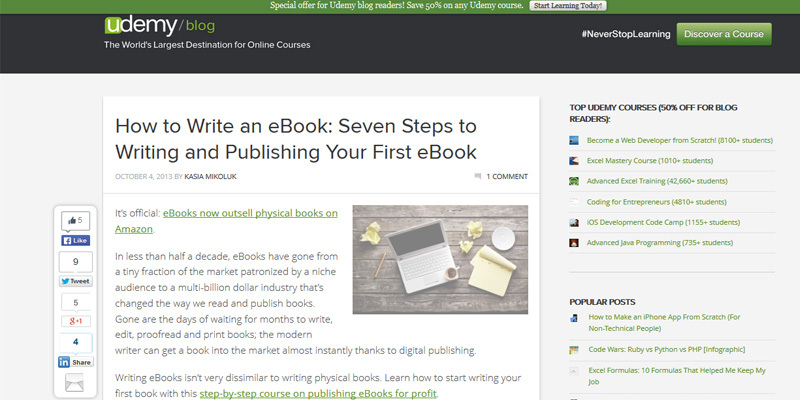 We want to be the hub for publishing lessons—both real life and in the classroom. This blog is about all things to do with Social Media and Online Marketing, including Twitter, Blogging, Facebook, YouTube, LinkedIn, Search Engine Optimisation (SEO) and and content marketing. The blog’s focus is to assist business in “getting found online” in a digital world and making your company visible and successful on a crowded web. I have a degree in Commerce and Economics and have spent most of my career involved with Information Technologies, Telecommunications and the Web Industry. 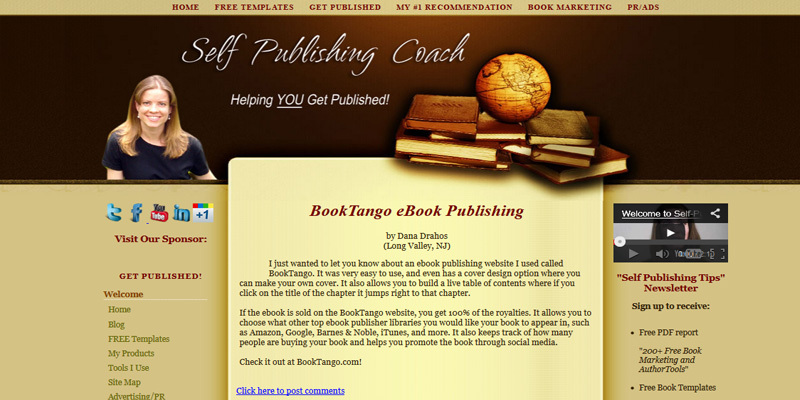 Self publishing has never been easier! Now, with the recent advancements in technology, anyone can get published. 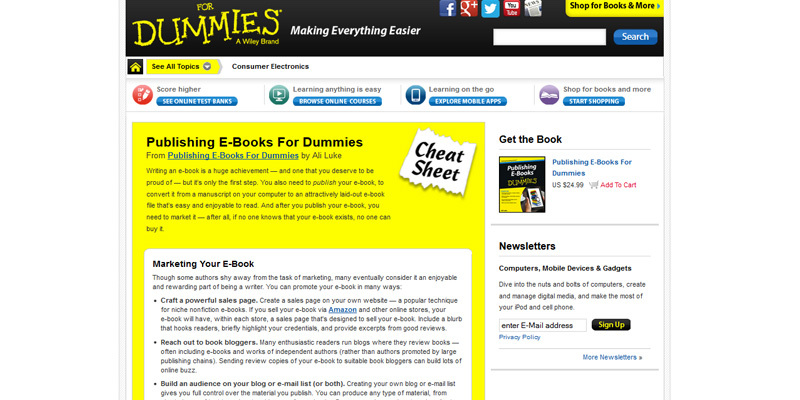 It’s not only simple, quick and doable to get your ideas published but will also save you money. It simply amazes me!